There is one precinct left to count of the 2,557 spread across Virginia, the University Hall precinct in Albemarle County, and Mark Warner has a 16,540-vote lead over Ed Gillespie in the Virginia U.S. Senate race. Must be a helluva lot of Republicans living around U Hall. We’re two days and counting past the election, and CNN, Fox, Politico and practically everybody else is still calling Virginia too close to call. Let me reiterate: we’re talking about a 16,540-vote margin between the two major-party candidates. Too close to call. The networks fell all over themselves to declare George W. Bush the winner in the 2000 presidential race when that one was anything but certain. Burned by getting that one wrong, and in the process giving Bush the upper hand in the PR battle that ensued with Al Gore, now the trend is to wait out the obvious. And this one is beyond obvious. Virginia has had two actual too close to call elections in the past decade, Bob McDonnell’s 360-vote win over Creigh Deeds in the 2005 attorney-general race, and Mark Herring’s 907-vote win over Mark Obenshain in the 2013 attorney-general race. Those went to actual recounts, with Herring, a Democrat, leading at the stage of the certification of results by 165 votes, gaining slightly, but significantly, in the context of that razor-thin race, in the recount, to win by 0.04 percent. McDonnell, a Republican, gained a literal few votes in the recount stage of his race, which came down to 0.01 percent. 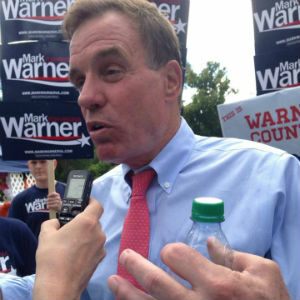 Warner’s lead over Gillespie is 0.76 percent. The margin isn’t 165 votes, it’s not 323 votes, it’s 16,540 votes. The last two recounts had average movement of around 375 votes in favor of the winning candidate. CNN, Fox, Politico, everybody else: it’s over.